Motivation. Impairments of gait and balance are among the most incapacitating and least well-understood symp-toms of Parkinson's disease (PD). Patients exhibiting such disorders endure difficulties that severely affect their everyday mobility and independence: they often require personal assistance, struggle to leave their homes due to the high risk of fall-related injuries, and in general they see their quality of life significantly diminished. Well-established neuromodulation therapies addressing Basal Ganglia dysfunction in PD, which for decades have been optimized for upper-limb, are highly effective for the symptomatic treatment of motor signs such as tremor, bradykinesia and rigidity. However they often fail to alleviate, or can even aggravate gait deficits, presumably due to the divergence in the nature and dynamics of the circuits that control locomotor function. A key limitation holding back the design of better focu-sed, evidence-based therapies is the lack of mechanistic readouts that correlate pathological neural activity patterns and leg dysfunction during gait, which can help characterise and predict when deficits arise, how they change across locomotor activities or under different neuromodulation conditions, and how they may be employed to optimize therapies. Goal. 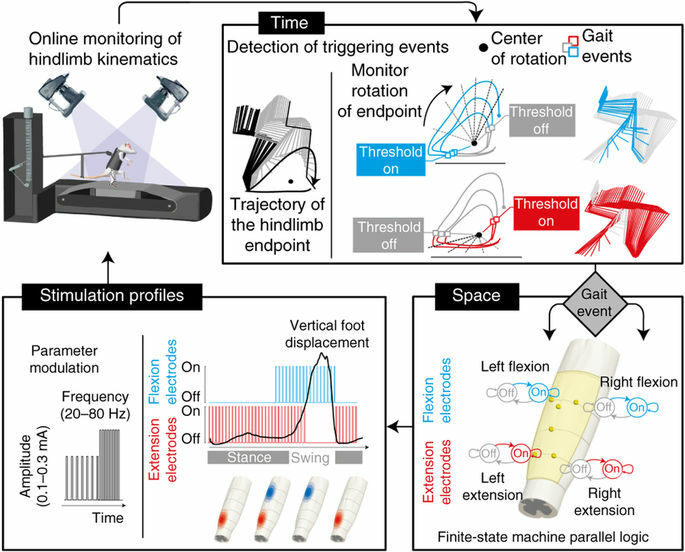 The identification of gait-related biomarkers is contingent on technologies, concepts and methodologies allowing to simultaneously record and link brain states to whole-body biomechanical features representative of gait deficits. We are combining a high-resolution tracking platform established at CHUV, with unique equipment for recording and modulating gait wirelessly and in real-time , in order to map the activity of subthalamic nucleus and cortical networks onto kinematic, kinetic, and muscle activity patterns while patients execute a range of activities of daily living. 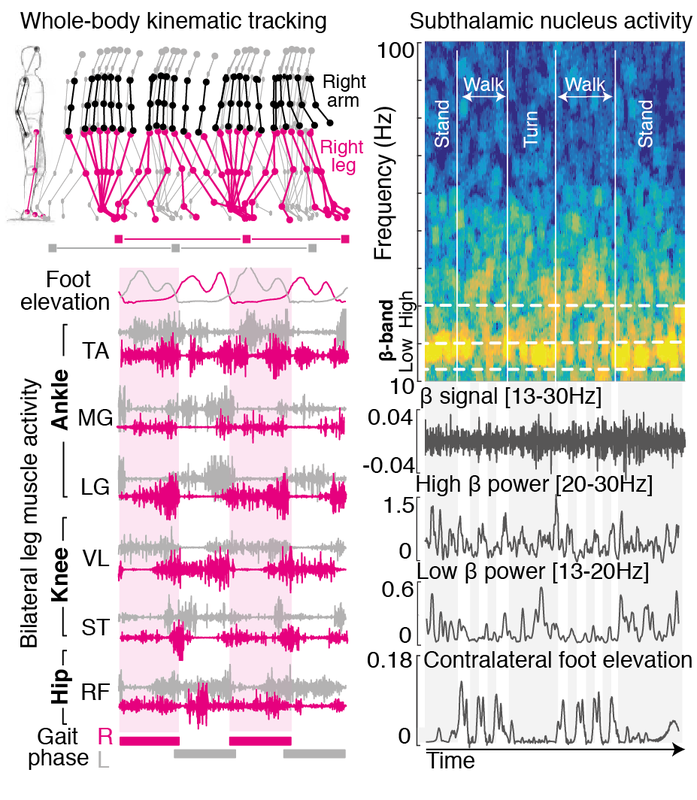 In particular, we are intersted in contrasting the neural correlates underlying basic walking, turning and precision locomotion in order to understand and predict leg force modulation in natural conditions. Motivation. Decision-Making studies commonly deal with finite (often binary), well-defined sets of choices. Instead, motor control is traditionnally concerned with continuous, high-dimensional spatiotemporal patterns of kinematic and kinetic changes that give rise to coordinated multi-joint movements. As a result of these dichotomies, the link between these two fields has remained largely unexplored, even though this understanding might be pivotal for the translation of existing theories and models of action selection to the study of motor dysfunction in neurological movement disorders, such as rigidity or bradykinesia. 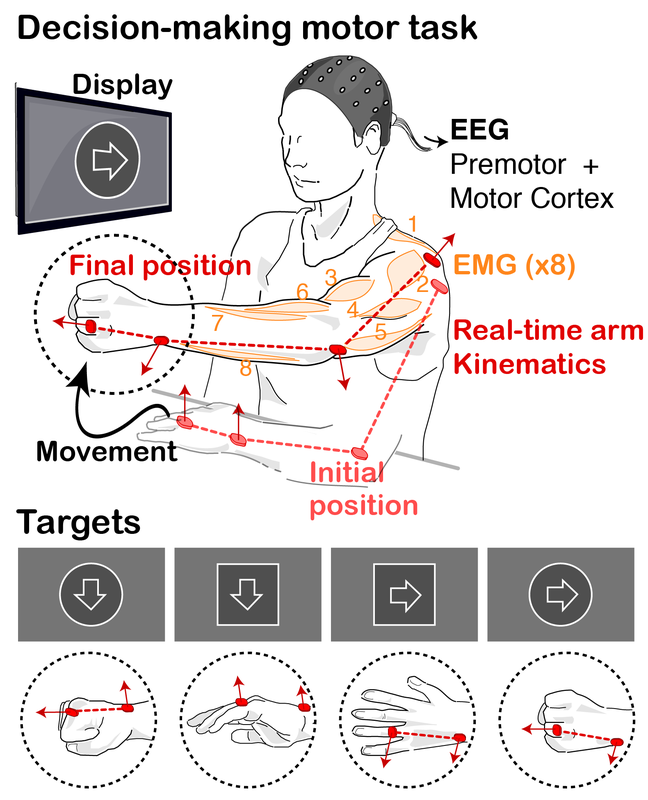 Over the past decades, theories of motor control have put forward the concept of modularity, whereby motor primitives, or synergies, underlie and help simplify motor pattern generation and coordination. Much work has been devoted to the mathematical procedures and neurobiological plausibility of synergies, along with their use to help asses and guide rehabilitation. Yet little effort has been devoted to understanding how or when these modules are activated by decision making centres during movement. Goal. We are combining behavioural experiments and mathematical models to study the interplay between decision making processes and motor pattern generation and adaptation, particularly in the context of Parkinson’s disease. We hypothesize that the modular organisation of movements might allow to unite theories of action selection and motor control, by providing a finite repertoire of lower-level motor primitives whose activation (or weights) are selectively regulated by decision making centres. In our tasks, we decompose movements into simpler motor components and probe the behavior and performance of patients when constructing, and correcting on the fly , movements requiring flexible combinations of these components. We can then correlate the underlying decisions to the motor states and biomechanical performance, and extract how movements are affected by deficits in specific brain circuits. Contributors: Dr Pirondini (EPFL), Dr Fisher (Univ Oxford), Dr Britain (Univ Birmigham), Prof Bloch (CHUV-UNIL), Prof Brown and Prof Bogacz (Univ Oxford). Motivation. Parkinson's disease is characterised by excessive levels of neural synchrony within basal ganglia networks, commonly illustrated by pathological oscillatory brain activity in the beta-band (15-30Hz). This biomarker has been thoroughly studied in past years: It has been identified across structures, and exploited to engineer the first generation of closed-loop Deep Brain Stimulation (DBS) therapies. However the connectivity origins that give rise to such oscillations are still unclear, and the time evolution of neural processes leading up to such synchrony are unknown. Goal. 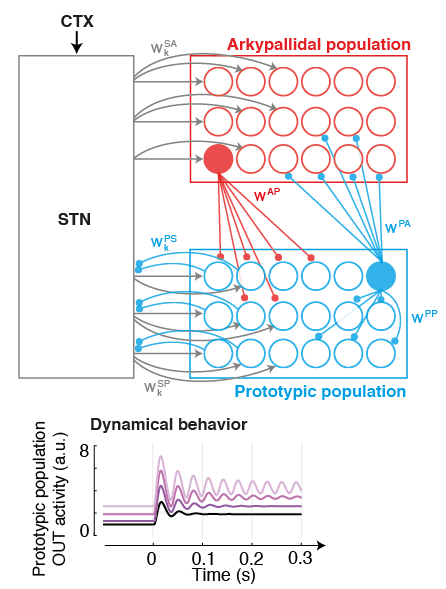 We are pursuing the development of neural models of key populations in the basal ganglia, together with machine learning-based decoders, in order to understand and predict the origin (and time evolution) of oscillatory patterns. These model-based predictors hold the potential to allow more precise targetting of pathological signatures with DBS, hence reducing side-effects and improving battery life. Contributors: Dr Tinkhauser (Univ Oxford), Prof Brown and Prof Bogacz (Univ Oxford). Background. Severe lesions of the spinal cord damage the neural pathways that connect sensory feedback circuits in the spinal cord with supra-spinal centres, and interrupt most sources of control and modulation. This loss of connectivity abolishes motor function and leads to paralysis of the limbs. However even in the absence of brain input, pools of motor neurons in the spinal cord are able to exploit specific proprioceptive signals from the legs and to generate coordinated rhythmic movements. After the injury, the SC retains this capacity but lacks the level of excitation required for this control to be manifested. This neural circuitry may be activated using epidural electrical stimulation (EES) of the spinal cord. EES helps modulate the excitability of these circuits, and restores the capacity of spinal circuits to interpret afferent feedback as a source of control, which can ellicit stepping-like movements in spinal rats on a treadmill. When changing the stimulus parameters, we can interact with the ongoing spinal dynamics in real-time and tune the level of exitability, which in turn regulate motor output. However, there are few guidelines available to guide the selection of the appropriate stimulus parameters; from an experimental point of view, their tuning is largely an ad hoc manual process that requires of extensive human expertise in order to comprehend the highly complex (and often unknown) dynamics of gait induced by EES. Goal. We are pursuing the development of automatic control approaches to optimize the stimulation paradigm online in space and time, accounting for the specific biomechanical state of the system in order to induce more natural and repeatable movements that may lead to improved rehabilitation. Our results show an unexpected level of controllability of the amount of flexion and extension for each limb , which can be exploited to correct gait asymmetries, reinforce loading and improve motor performance for each subject individually. Contributors: Dr Capogrosso (Uni Fribourg), Prof Courtine (EPFL), Prof Bloch (CHUV-UNIL).